The adjoining Tom A. Freeman Preserve and Marshall Nature Area create a 138-acre tract of rolling woods on the edge of the village of Dixboro, making the two parks a quick escape from the urban trappings of Ann Arbor. The natural area lacks any outstanding features or even a body of water other than a sluggish stream but trail runners in particular love the topography and the challenge that the hills, ridges and slopes add to their workouts. Trails in both parks merge into a 3-mile system that stretches northwest from North Dixboro Road to a pedestrian entrance off of Ford Road. The adjoining Tom A. Freeman Preserve and Marshall Nature Area create a 138-acre tract of rolling woods on the edge of the village of Dixboro, making the two parks a quick escape from the urban trappings of Ann Arbor. The natural area lacks any outstanding features or even a body of water other than a sluggish stream but trail runners in particular love the topography and the challenge that the hills, ridges and slopes add to their workouts. The 59-acre Freeman Preserve was owned by the Domino’s Farms Corporation – the pizza people – when in 2013 the Washtenaw County Parks and Recreation Commission purchased the tract with a Michigan Natural Resources Trust Fund grant and a financial contribution from Ann Arbor Township. The preserve is well forested and features some impressive oaks along with wetlands surrounding Kirk’s Brook, a tributary of Fleming Creek. 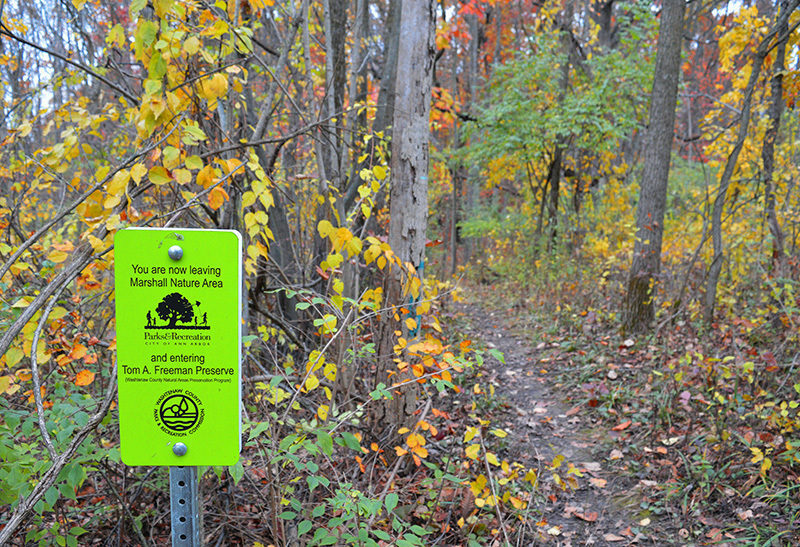 Adjacent to Freeman Preserve to the east is Marshall Nature Area, a 79-acre City of Ann Arbor park whose parking area and trailhead off North Dixboro Road serves as the main entrance to the trails. 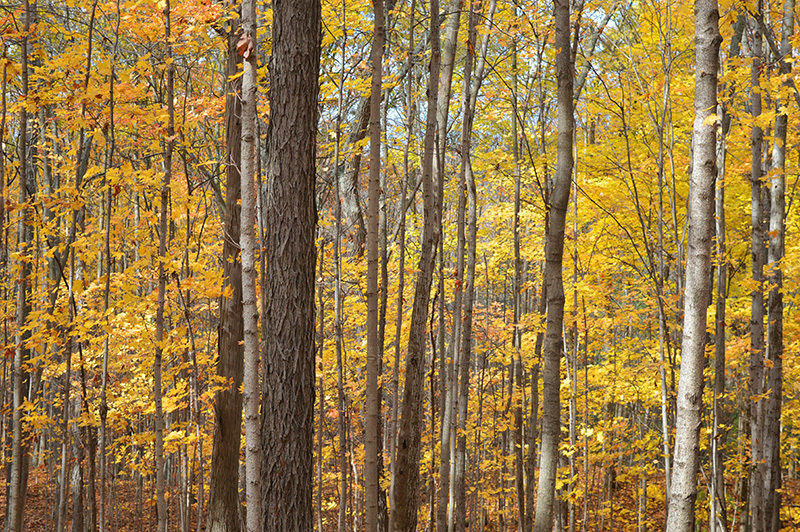 Much of Marshall is also well forested with mixed hardwoods such as oak, hickory, maple and beech. Dogwoods and a variety of wildflowers add color to the park in the spring while fall colors peak mid to late October. Pockets of planted pine and spruce are found on the south and west side of the park. Trails in both parks merge into a 3-mile system that stretches northwest from North Dixboro Road to a pedestrian entrance off of Ford Road. On the county park map the main trails are labeled as Red, Yellow, Green and Blue but that isn’t the case in the parks themselves where black spray paint blazes on trees are for the most part the only markers seen. Despite the lack of signage and a handful of social trails, it’s hard to get lost in these parks as the well-beaten paths are easy to distinguish. The described trail below is the perimeter of the system and follows the Red and most of the Yellow Trail to form a 2-mile loop that begins at the Dixboro Road trailhead. In the spring, sections of this route can be wet and muddy. 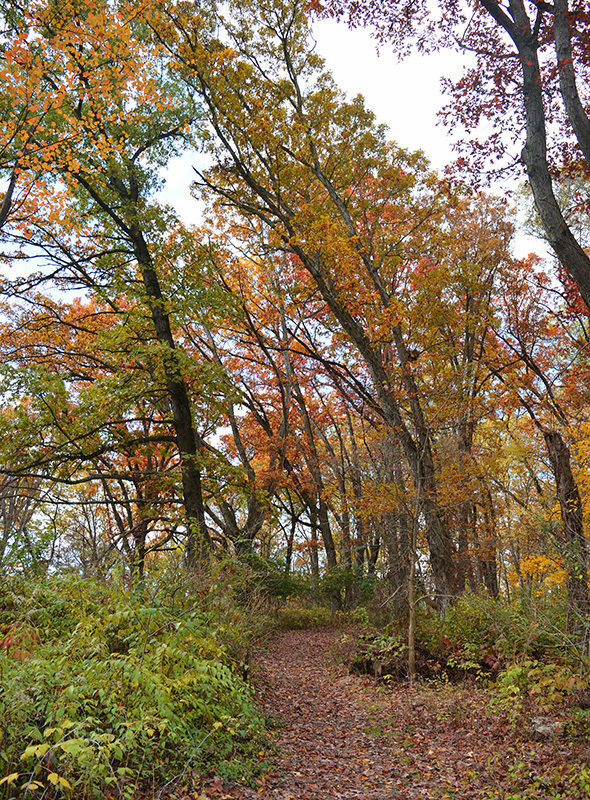 In the parking area of the Marshall Nature Area a posted trail heads west to climb a oak-forested ridge and in a quarter mile descends to a junction with the return of the Red Trail. Head right. The terrain levels out, passes the junction with one segment of the Green Trail at Mile 0.35 and then moves into a second growth forest. Along the way you enter the Tom A. Freeman Preserve, named for a former Washtenaw County Parks director. At Mile 0.8 is a junction with a short spur that passes beneath a powerline to Ford Road. The Red Trail heads left to climb a ridge and at the top merges into the Yellow Loop. Continue west (right) to quickly reach the junction with the Blue Trail. The Blue Trail is a spur that descends off the ridge to the west and in 0.3 miles reaches the pedestrian entrance on Ford Road. This spot can be a little confusing but follow the black blazes that point south (left). You’ll make a sharp descent off the ridge and bottom out within view of Kirk’s Brook and Gabriel Richard High School on the other side. The trail then climbs away from the stream, passes two junctions (stay left) and some impressive maples before arriving at a junction marked by a Freeman Preserve boundary sign. Head right for another steep climb to top off at a junction at Mile 1.4. Head right on the Red Trail here to re-enter the Marshall Nature Area and continue with the rolling terrain. After passing a junction with the Green Trail you return to the first junction of the day at Mile 1.8. Head right to descend to the Dixboro Road parking area. Other than parking for a half dozen cars, there are no other facilities at the Dixboro Road trailhead. Both parks are open year-round. There are no fees for entry or parking. From US-23, take exit 41 for Plymouth Rd., head east. Turn north onto Dixboro Rd. The Marshall Nature Area parking area and trailhead is the first driveway on the west side of the road. A secondary pedestrian entrance can be accessed off of Ford Road. From US-23, take exit 41 for Plymouth Road and head east. Turn north onto Earhart Rd and then west on Ford Road. The pedestrian entrance for the Tom A. Freeman Preserve is on the south side of Ford Road. You cannot park along Ford Road. 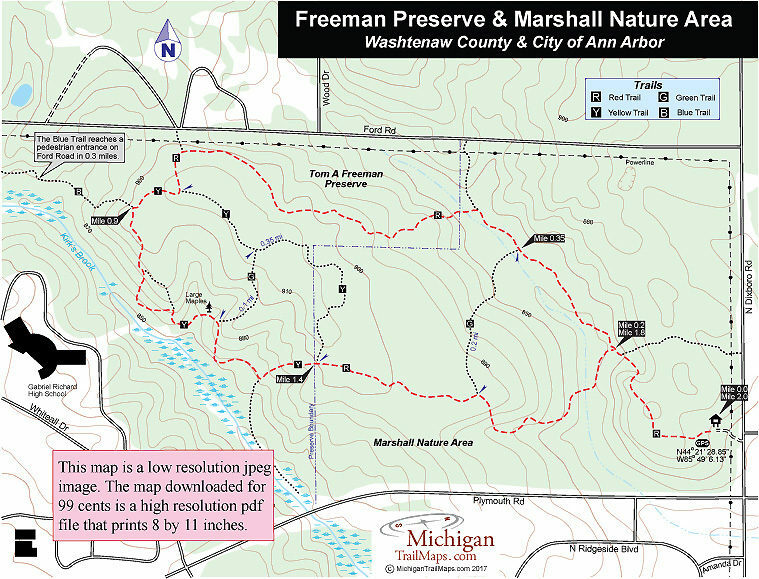 Contact the Washtenaw County Parks and Recreation Commission (734-971-6337) for more information about Freeman Preserve and the City of Ann Arbor Parks and Recreation (734-794-6230) for Marshall Nature Area.